Moon sign Libras are fond of living in harmony – so they feel satisfied and happy. ♎ Ups and downs are not usual in Libra’s life. Preponderantly he is even-tempered and close to himself. As a result of his inner peace serves the ability to solve inner and outer conflicts quickly. Keeping his balance is his proper part and to deliver this state of mind to his coevals as well. Moon sign Libras are fond of living in harmony – so they feel satisfied and happy. 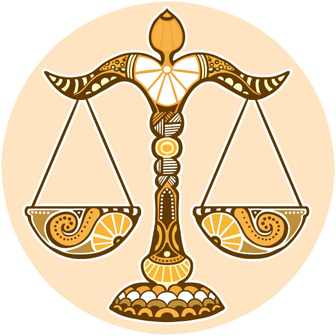 Being confronted with conflicts Libras use their particular skill to act diplomatically and with sensitiveness. Belonging to their peace of mind they need good friends and a relationship rich in harmony. They prefer having conviviality, recognition and benevolence. They adore arts and beauty - beautiful things they collect and surround themselves with such goods. Their home has an aesthetic interior. In fact their home is the ideal place for meetings and festivities. Within their relationship their long for harmony and caused by this desire they tend to neglect their own conviction – mostly these structures of behaviour are not a useful way to give in a satisfying relationship. Click here to calculate your moon sign.